Shahrisabz is a city in southern Uzbekistan, near Samarkand as well as the border with Tajikistan. Shahrisabz means 'green city' in Persian, probably owing to the vineyard and orchards in the area. Shahrisabz is noted for being the birthplace of the great ruler of Central Asia named Timur, made famous in Western lore as Tamerlane by authors such as Shakespeare. Shahrisabz is an ancient city in Central Asia, having just celebrated its 2700th anniversary. It is near Shahrisabz that Alexander the Great spent winters and met his wife Roxanna and that the general Ptolemy defeated the Achaemenid Empire. Like many cities in Uzbekistan and Central Asia in general, Shahrisabz was a city along the famed Silk Road. Shahrisabz came under the rule of the city of Bukhara until Russian occupation in the 1800s. Shahrisabz boasts so many historic monuments that its old city has been made part of the UNESCO World Heritage List. Visitors to Shahrisabz tour these amazing monuments, which include Aq-Saray Palace, Kok Gumbaz Mosque, Hazrat-i Imam Complex, and the Tomb of Timur. Aq-Saray Palace was the ruler Timur's summer palace in the 1300s, and is also known as the White Palace. It was to be the grandest of Timur's buildings, and its archway is the widest in Central Asia, but today only parts of the palace remain. Travelers to Shahrisabz can stare in awe at the ruins of the 200-foot gate towers, which are covered with white, gold, and blue mosaic tiles and an inscription that reads "If you challenge our power, look at our buildings!" Kok Gumbaz Mosque was built in Shahrisabz in the 1400s and is named for its blue dome. 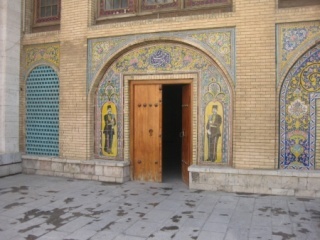 Right behind the mosque is the so-called House of Meditation. 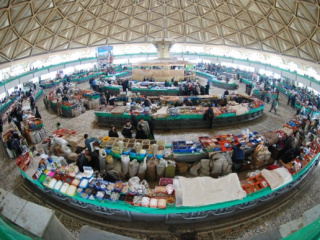 The Hazrat-i Imam Complex is a series of buildings that includes a mosque and impressive geometric mausoleum, where Timur's oldest son is buried. Nearby is a recently-discovered underground chamber that was meant to be the tomb of Timur himself. However, Timur was buried in Samarkand instead of Shahrisabz, so the identities of the bodies in the chamber remain a mystery. In addition to those famous monuments, a tour of Shahrisabz can also take in the domed medieval baths and the 300 year old Chorsu bazaar. Shahrisabz is a noted center for folk arts, and work from the area has traveled in international exhibitions. Local Shahrisabz craftspeople are still engaged in these traditional arts making hats, carpets, and belts, which make for excellent shopping opportunities. Shahrisabz speaks to the impressive past of Uzbekistan, and presents the traveler with a lush green city set against scenic mountains.